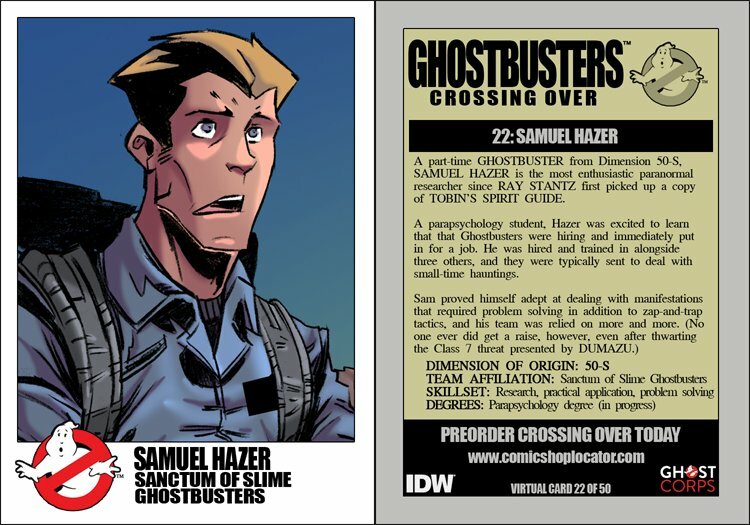 A part-time GHOSTBUSTER from Dimension 50-S, SAMUEL HAZER is the most enthusiastic paranormal researcher since RAY STANTZ first picked up a copy of TOBIN's SPIRIT GUIDE. A parapsychology student, Hazer was excited to learn that the Ghostbusters were hiring and immediately put in for a job. He was hired and trained in alongside three others, and they were typically sent to deal with small-time hauntings. Sam proved himself adept at dealing with manifestations that required problem solving in addition to zap-and-trap tactics, and his team was relied on more and more. (No one ever did get a raise, however, even after thwarting the Class 7 threat presented by DUMAZU. ).